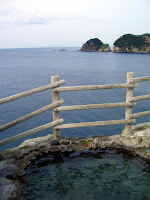 I visited 伊豆半島 (Izu peninsula, Japan) on 20-21 January 2007 with 明日香 (Asuka) to discover a new part of Japan and enjoy an open-air hot spring with an oceanic view. To avoid resorts, we directly reached 下田 (Shimoda), where we strolled a while and visited temples; we particularly appreciated the view over the bay from 寝姿山 (Mount Nesugata). In the evening, we rode a fun train to 蓮台寺 (Rendaiji), and spent the night at 金谷旅館 (Kanaya ryokan), which was expensive but huge, with a gorgeous hot spring. The next day, we enjoyed the landscapes of the peninsula by bus. We stopped at 堂ヶ島 (Dogashima) to bath in the tiny 沢田公園露天風呂 (Sawada-koen open-air hot spring) and to see the coast by boat. We then rode a bus to 修善寺 (Shuzenji city), where we visited 修善寺 (Shuzenji temple), and paddled in a mineral hot spring situated on a rocky promontory in the middle of 桂川 (river Katsura) called 独鈷の湯 (Tokko-no-yu).